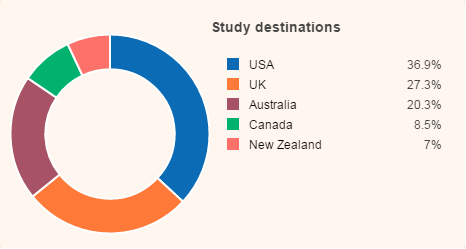 Hotcourses data, which enables over 23 million users to research overseas study each year, has seen a slight increase in international students looking to study in the United Kingdom since the vote to leave the European Union. Comparing the four weeks in the run up to the referendum vote (May 26th – June 23rd) with the four weeks following the referendum (June 24th – July 21st), there has been an increase in the market share of searches to the UK from 27% of searches to 27.3%. While most commentators and reactions to the Brexit vote suggests that it is highly likely that this will lead to a perception that the UK is less welcoming, our data suggests there might be a short term increase. This data draws on over 1,630,000 students who used the Hotcourses international website in the eight-week period from May 26th – July 21st looking at international study specifically for the USA, UK, Australia, Canada and New Zealand. Aaron Porter, Director of Insights, Hotcourses, said: “It may seem counter-intuitive, but this data gives us confidence that despite Brexit there could be a short term increase in applications both internationally and from the EU specifically. Many EU students may look to study in the UK within the next two years while they are still eligible for a tuition fee loan, before any new arrangements come into force, meaning we could see a pronounced increase before a fall. “The drop in the pound against most major international currencies, including the Euro, will also make it cheaper for students looking to study in the UK helping to make it a more attractive destination.